I just come back from a very intensive week with Wai Tuora-Morgan and Dave Hegglun in which I had very intensive contact with the nature spirits who are not dryads (the higher self of the trees) but who live in the forest and help the trees and animals if they get ill. They, so to say, keep an eye on everything in the woodlands and also clear it from negative energies. They have to draw back if humans do not acknowledge them. They are in oneness with everything and do not feel seperated from each other or from spirit (God/Goddess). They are in tune with everything that is and say that we do still live in Paradise without realising it. It is our thoughts and our believesystems that keep us apart and build walls arround us so that we do not touch one another in our hearts. We are afraid to love and to show ourselves, our true selves, which is love. Fear keeps us apart but doing out of love for one another heals us and others and brings us back together. If we really wish for someone to feel good and to be healthy and heal with all our heart than healing can happen. We only have to take the risk to follow our intuition, our divine thoughts, the first one that comes to mind and do it however stupid and idiotic we think it might be. We need to take the risk to be making a complete fool out of ourselves in front of everybody than healing can take place. If we take the risk. 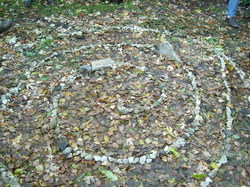 In this context I gave my word to the nature spirits to help them do their work to stabilise our Earth Mother by putting up spirals everywhere I go on privat ground with permission and link them to all the other spirals which will be build to support the nature spirits everywhere in the world from Dave Hegglun and all of the Whare Wananga students and to the spiral we had build in Toggenburg/Swiss. With the Earth Medicines developed by Wai's other student group I will try to do my bit to help us and our friends the trees and the nature spirits through this times of change to come. 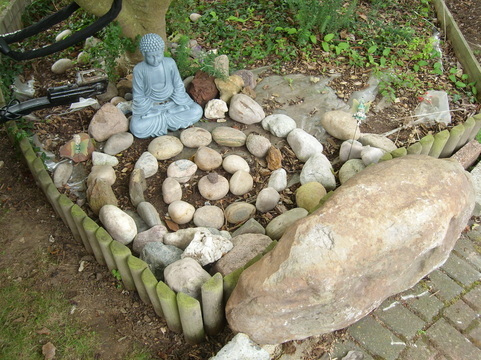 If you want to support the nature spirits stabelising and healing our Earth Mother by building a spiral please contact me directly.